One of the most anticipated Twitter clients for the iPhone finally hit the App Store yesterday, and I was staggered by the attention it received within its first few hours – I can’t remember the last time an iOS application launched with that kind exposure – especially not a Twitter client. From Tapbots – the creators of Convertbot, Pastebot and Weightbot – Tweetbot promises to be a full-featured Twitter client with a lot of personality; boasting a meticulously crafted user interface, smart gestures, and customizable navigation. Tweetbot’s launch is big news today – it’s all over Twitter and many publications are dubbing the application a Twitter for iPhone killer. But is it as good as the release day hype would have you believe? Find out in our review after the break! First impressions are really good; Tapbots have clearly put a lot of time and effort into making sure Tweetbot looks good. Its user interface is clean, elegant, and highly polished, with pleasant little attentions to detail that come as a nice surprise – such as the glowing wheel that rotates when you pull down to refresh your timeline. It’s easy to navigate your way around the application and find the functions you’ll be using regularly. The tabbed navigation bar at the bottom remains true to the traditional method of iOS app navigation, and two of the five tabs can be customized for one-tap access to favorites, retweets and lists. You can also perform functions by interacting with the tweets in your timeline: swiping to the right displays the conversation thread of each tweet, and swiping to the left will find recent related tweets. Tapping a tweet twice displays buttons that enable you to reply, retweet and favorite the message; copy, email, or translate it; and view additional information including the date and time the tweet was posted and which Twitter client was used. The triple tap function can be customized within the settings; as default it’s set to reply to a tweet, but you can also set it to retweet, favorite, or translate a tweet. While Tweetbot’s navigation is largely similar to other iOS Twitter clients, its standout little differences are what make it unique. It’s easy to get used to the way in which the application works, and you’ll really love its simplicity. Tweetbot’s wealth of features will ensure you want for nothing more, such as support for multiple timelines; support for services like Read It Later, Instapaper, CloudApp, and URL shorteners; and the ability to attach location data, photos, and videos to your tweets. Having used the application pretty intensely since its release, I’m yet to find a common function that isn’t present. I should also point out that version 1.0 of the app is also yet to crash on me. 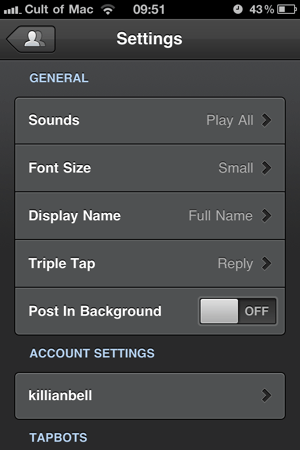 Tweetbot’s settings are limited, but I think it still enables you to customize all the preferences you’ll want to. Turn its sounds on or off; select from 3 different font sizes; display usernames or real names in your timeline; turn background posting on or off; and choose the services you wish to use for URL shortening, saving tweets, and uploading images and videos. There’s no choice of themes like you’ll get from some other clients, but this won’t be an issue for most – the UI is pretty enough already. One of the only downsides to Tweebot is the lack of dedicated notifications – though there is support for notifications through Boxcar, I’d still prefer to have them built-in. Overall, Tweetbot is fast, intuitive and very stable. It’ll do everything the vast majority of Twitter users want from an iOS client, and it’ll do it in style. Thanks to its looks, simplicity, and stability, it beats most other clients in the App Store. It was always going to have a lot of interest on release because of the other great applications its developer has released, and it certainly lives up to the expectations we had for it. While $1.99 may seem slightly steep for a Twitter client, when you compare it to the price of its biggest competition – Echofon Pro ($4.99), Twittelator Pro ($4.99), Osfoora ($2.99) and Twitterrific ($4.99) – it’s actually pretty good value for money. 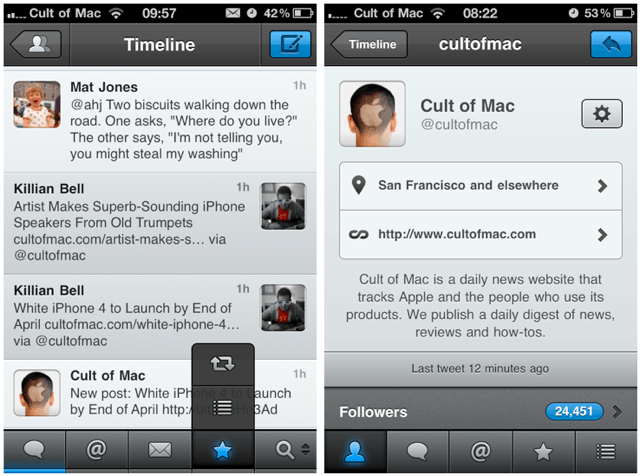 We’ll be adding Tweetbot to our list of The Best Twitter Apps for iOS very shortly.